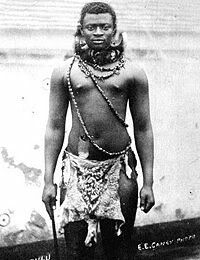 Dinuzulu's son Solomon kaDinuzulu was never recognized by South African authorities as the Zulu king, only as a local chief, but he was increasingly regarded as king by chiefs, by political intellectuals such as John Langalibalele Dube and by ordinary Zulu people. In 1923, Solomon founded the organization Inkatha YaKwaZulu to promote his royal claims, which became moribund and then was revived in the 1970s by Mangosuthu Buthelezi, chief minister of the KwaZulu bantustan. In December 1951, Solomon's son Cyprian Bhekuzulu kaSolomon was officially recognized as the Paramount Chief of the Zulu people, but real power over ordinary Zulu people lay with white South African officials working through local chiefs who could be removed from office for failure to cooperate.